Bali is wonderful! Bali is great! Bali is fabulous! But we have one huge problem: the wildlife. Wildlife is probably not technically the correct word here, as the main culprits are (in order) spiders, chickens, and dogs. None of those are really “wild” animals (are spiders? they’re certainly not domesticated…), but to me: WILDLIFE. I’m not even joking, it crossed my mind to scrap this entire “live abroad” thing and move home in a hurry because OMG THE SPIDERS. But then we paid fifty one million in rent, for the next six months, so… I’m stuck. Let’s just make sure everyone knows that figure is most certainly NOT in US dollars. Seriously though, the spider thing here is freaking me out. I’ve never loved spiders, but never considered myself to be a total ‘fraidy cat. I can handle stuff! I’m tough! But I’m really not tough when it’s late, and I’m tired, and I’ve just taken out my contacts, and it’s the first night in our new house, and I see a MASSIVE dark fuzzy blob (fuzzy both because it has hair and because I’m nearly blind) scuttle a foot in front of my foot heading in the same direction as I am — TO THE BED. Commence shrieking, leaping into bed (the spider is now UNDER the bed), and feeling like my stomach is going to surge straight out of my throat. WHAT THE HECK WAS THAT!? OK, in reality I didn’t “shriek” — I’m more refined than that. I probably squeaked and said “OMGOMGOMG” and insisted Derek do something. Thank goodness for husbands that aren’t afraid of spiders! The only issue was that he really couldn’t do anything about it. It was under the bed, until we saw it scuttle off towards MY HALF UNPACKED PURSE, where it remained through the night. I did not fall asleep as quickly as I’d hoped that night, and woke up with a start at any breeze on my skin. NOT cool, spider! NOT cool. I’m not even sure spider is the right word — is it a tarantula? It was darn big (like, the size of my palm), and hairy, with thick legs. Blech. That creeps me out just to remember. Derek tried to take care of it the next morning, as we could see it hiding out behind my purse, but any attempts to get it (in an upside-down bowl) were unsuccessful. It was a fast little demon! We finally gave up and let him hide behind our armoir, at which point I cleaned up that small pile of my stuff so it wouldn’t hide in it again! That was two days ago, and I’ve yet to see it again… but I’m not so sure this war is over. YIIIKES. The other two “wildlife” issues are slightly more minor: the roosters that start causing a ruckus at 4:30 am, and the dogs that chase them into our open house mid-morning. The dogs are OK on their own — usually — and the come around to check on us periodically, but if they’re chasing a chicken at full speed towards our house, I have a different opinion. I was just walking out the door to head to yoga when such a situation occurred — I first saw a flustered chicken heading at our door at full speed, followed closely by Millie, the neighbor dog. I wasn’t sure I was actually seeing this happen, and was in a hurry so yelled to Derek to look out — he was going to have to deal with this one too! As he groaned “Are you SERIOUS! ?” upon finding the chicken in the house, I heard all the pots and pans come clattering to the floor with the ruffle of wings… I started the motorbike and headed down to yoga. Both dog and chicken were gone when I returned, so I think that worked out ok! Now we have a gate, so the dog/chicken thing shouldn’t be such an issue. The spiders though… Uuurgh. 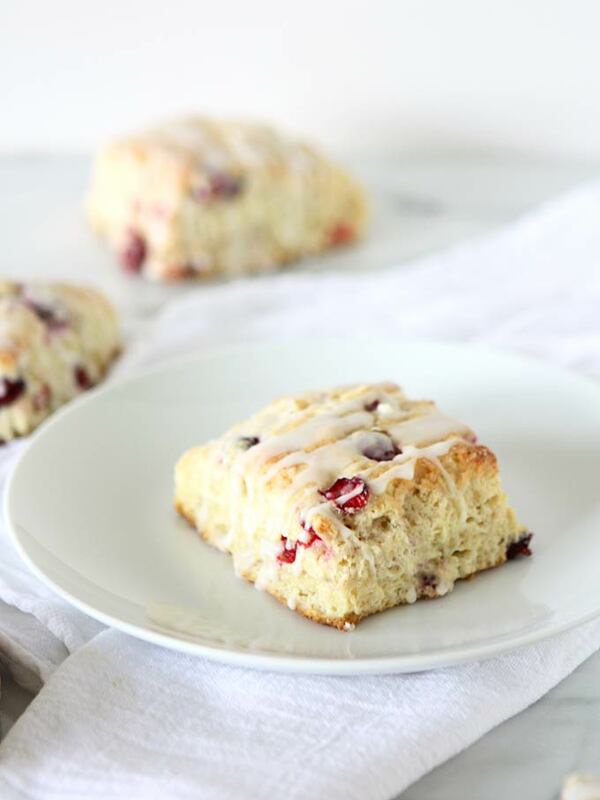 I am BEYOND excited to share this recipe with you guys today — I’ve been holding onto it for a few weeks now and am still thinking about how delicious these scones were. While we were in Portland we made a new friend who sells essential oils and has an incredible wealth of knowledge about them. I LOVE essential oils, but don’t actually know the full depth of their uses/benefits. He gave us a little bottle of “Wild Orange” — which smells delightful and instantly brightens your mood! — and having just bought pounds of fresh cranberries at the coast, I knew what I had to do. 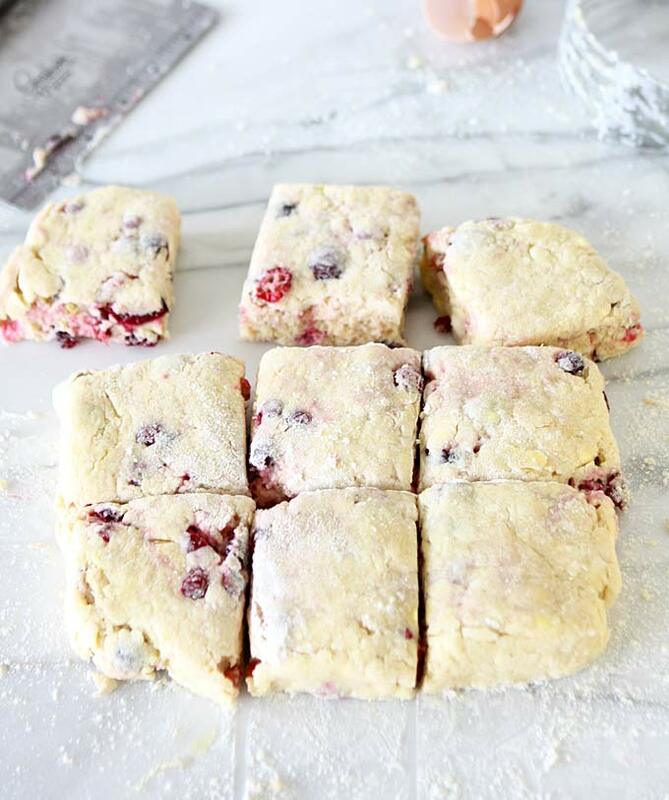 Make scones! I’d never cooked with essential oils before, and was fascinated to learn that you actually can! Before we get too far, let me warn you that not all essential oils are safe for consumption. You need to get a top-quality oil that is certified safe for ingesting. I used doTerra brand, which is one of the best! The one I used for this recipe can be found here. 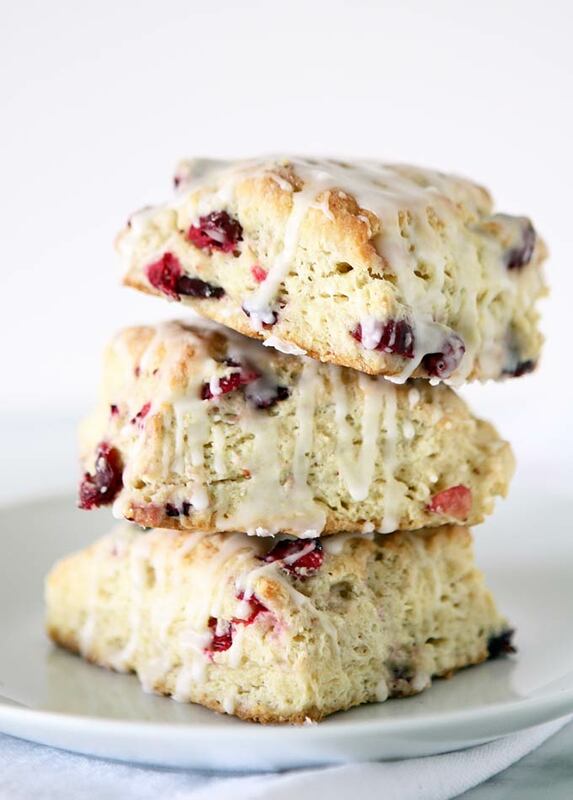 These scones seriously were perfect. They had a crispy golden out layer, and were soft and moist on the inside. They texture was SPOT ON. The flavor, too, was to die for. The orange from the essential oil came through perfectly, with a sweet citrus that fabulously complemented the tangy cranberries. 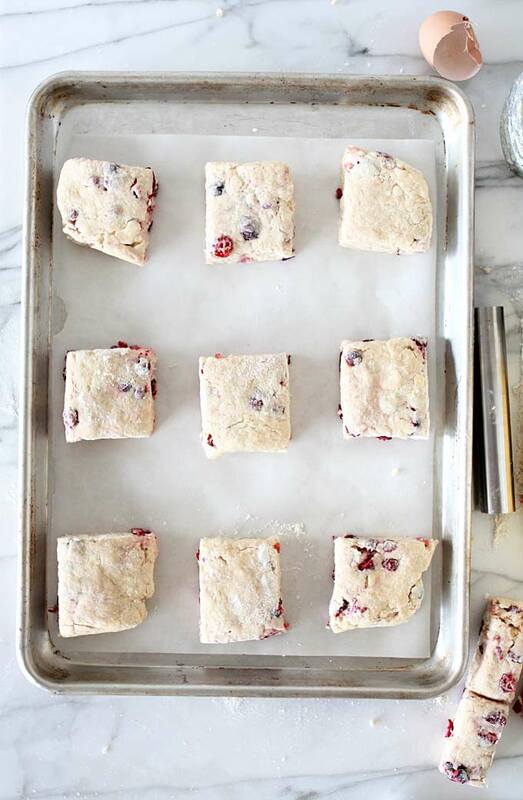 All of this enveloped in a buttery dough made for the perfect scone. Amazing! You HAVE to try these! Now, I’m off to spray the house with peppermint essential oil, which I hear spiders do NOT enjoy. Adios, furry creepy crawlies! Using a pastry cutter, or your food processor, cut the cold butter into the dry ingredients until no pieces are bigger than peas. Combine the wet and dry ingredients and mix until just coming together. 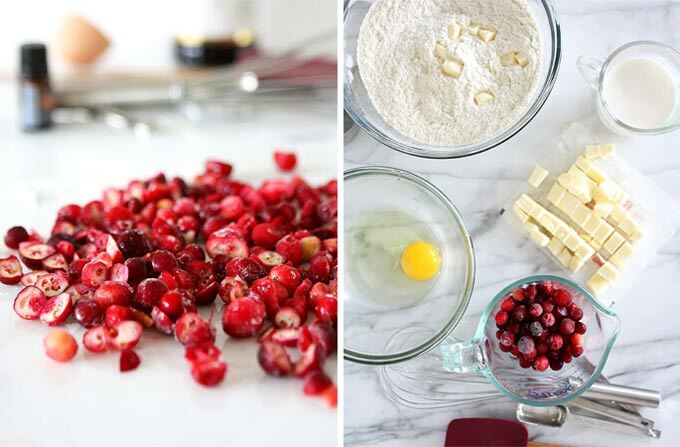 Add the chopped cranberries, and fold in carefully. Turn the entire mixture out onto your floured counter and knead 4-5 times until it really comes together. If your dough is warm and sticky, shape it into a disc and wrap it in plastic wrap, and freeze for 10 minutes before continuing. Shape into a rectangle 1″ thick, and cut into 9 equal pieces. 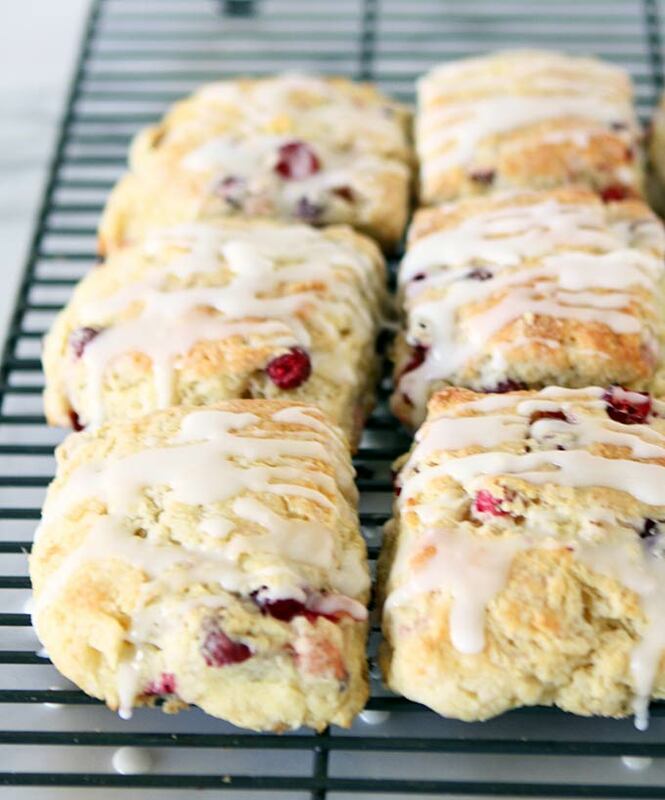 Combine all the ingredients for the icing and drizzle over cooled scones, when ready. Spiders, ugh. I don’t know if I could live in a tropical place. This is the time of year, here in Colorado, when all the spiders decide they’d rather live in our house. Clean up the dirty clothes pile, spiders. Step in the shower, spiders. Not huge tarantula ones, but some are pretty large. And we’ve killed several black widows around our property, so ick. I hear ya, thankful for husbands who are not afraid of spiders. I don’t think I’ve made scones in about 10 years, even though I make biscuits all the time. These look delicious! They’re EVERYWHERE! I’ve yet to find one in the shower, so you’ve got that on me! (not that I’m jealous, you can definitely keep that experience and I’ll hopefully avoid it). Yes, diluted in a spray bottle has been my method. I looked up some ratios online and chose a milder one the first time, then upped the #of drops the next time I made it. Probably 6-8 drops in a 16-oz. spray bottle is what (-ish) I’m currently using. So excited to whip these up this morning! I’m an EO newbie, and I’ve got a big bottle of doTerra Wild Orange ready to go. Oh yay! Enjoy!! So far the peppermint has been working wonderfully for me — good luck with yours! Delicious! Orange Essential Oil – I hadn’t thought of that as an ingredient before. Also loved the update about life in Bali. Thanks, Karletta!! Cooking with essential oils is something I often forget about … it’s nice to be reminded! Love your recipe, sure going to try it….but I have Orange extract, so I may just use that…..
Wow what Country do you live in ? I feel your pain…..I hate spiders too….. I heard they don’t like Peppermint, hadn’t heard anything about Orange as the other lady mentioned…..but it won’t hurt them, says it will keep them away….so they just find some place else to go….I don’t want to just send them to another area in my house, I want them completely gone forever……know what I mean? Loved your story about the spider tho…keep us posted on your spiders…..and your life where ever you are….